Days of Destruction, Days of Revolt by Chris Hedges and Joe Sacco is one of the infernal documents of our new century. With Sacco providing vivid illustrations and Hedges furnishing the fearsome prose, they visit four of the most devastated communities in the U.S. and uncover what unfettered corporate capitalism has done to American life, finding despair, blight, poverty, crime, addiction, violence, and environmental degradation on an inconceivable scale, in all cases enabled by the total corporate takeover and corruption of government at all levels. In the hopelessness, violence, and addiction they encounter at the Pine Ridge Indian Reservation in South Dakota, Hedges sees a picture of America’s immediate future. “The tyranny we imposed upon others is now being imposed upon us,” he writes. In the post-holocaust conditions of Camden, New Jersey, they find the grimly logical final act of the “weak being forever crushed by the strong”. Hedges describes the country’s poorest urban centre as “the poster-child for post-industrial America”. In the mining towns of West Virginia, schools are equipped with inhalers because of the coal dust saturation, entire communities sit beneath toxic slurry impoundments waiting to collapse, and disease and addiction run rampant while the Appalachian Mountains are blown to smithereens. In Immokalee, Florida, Hedges and Sacco meet “the model worker in the corporate state”, finding slave camps where illegal immigrants pick pesticide-laced and nutrient-free tomatoes for Walmart. Already imprisoned by debt peonage and fear, they are literally, in some cases, kept in chains. Finally, they arrive at Occupy, where Hedges presents a rousing corrective for the “radical and retrograde forces within the body politic”. With the force of history at its back, Hedges states, Zuccotti Park is where “the revolution began”. Chris Hedges was in New York when the Georgia Straight reached him to discuss the book, Occupy, his career, Stephen Harper, and his ugly encounter with the CBC’s Kevin O’Leary back in October. Georgia Straight: Did you see Alexander Cockburn’s July 6 article on Occupy? Chris Hedges: No, what does he say? CH: Well, I guess he’s talking about me [laughs]. GS: Is he talking about you? CH: I dunno. As far as I know, Cockburn never spent any time with the Occupy movement. This is the problem when you don’t get out. You cast these Olympian judgements from the heights of wherever you’re seated. It’s the ruling class that determines rebellion, and response, and if the ruling class responded rationally to the grievances and injustices that push people into these encampments, they could dissipate the movement in an instant. That would mean a huge jobs program targeted at those under the age of 25; it would mean a moratorium on foreclosures and bank repossessions, a forgiveness of student debt and a rational healthcare plan, i.e. medicare for all. But they didn’t do that. They used exclusively the language of force to try and physically erase these encampments, and then have ratcheted up their assault against the poor and the underclass by refusing to extend unemployment benefits for hundreds of thousands of Americans; by cutting the food stamp program, and one in three children in this country depends on food stamps to eat; and by having the supreme court, which is a wholly owned subsidiary of the corporate state, pass a ruling that severely weakens public sector unions, the last redoubt of union activity in the United States. You know, Cockburn should go back and read Karl Marx. Unfettered capitalism is a revolutionary force—it knows no limits and it has built within it the qualities of its own self-annihilation. And that’s where we are. Now, what will happen? I’ve covered movements all over the world, and as far as I know, Cockburn has not. I’ve been in the midst of the revolutions in Eastern Europe, the uprisings in Palestine, both of the Intifadas, the street demonstrations that brought down Milosevic… Occupy is a tactic in the same way that the Freedom Rides were a tactic. What follows may not look like Occupy, it may not even be called Occupy, but as somebody who just spent the last two years in the poorest pockets of the United States for this book I did with Joe Sacco, Days of Destruction, Days of Revolt, I can tell you that something is coming. That I have no doubt about. And I’ve been in the midst of disintegrating societies, I know what they feel like, smell like, look like, and Cockburn’s just wrong. GS: Why do we see this kind of resistance to Occupy from what you might call the professional left? CH: Well, the problem with pundits, and it’s not just the left, is that they don’t report, and the beauty of being a reporter is that so many of the assumptions you carry out into the street are proven wrong, no matter how smart you are. And this book is so heavily reported, you know, it keeps you honest. You have to go out and listen, you have to look, you have to spend days and weeks outside of your own circles, your own milieu. They’re often a victim of their own intelligence, and, of course, Cockburn is nothing if not intelligent. But they sever themselves from what’s happening, and they make judgements without having gone out and done the hard legwork that reporters do. And I think, in a sense, in order to remain intellectually honest, you have to be out there. GS: I’m sure you’re aware of the oil sands and Canada’s metamorphosis into a petro-state. CH: Yeah, I mean, Harper is sort of a poster child for corporate malfeasance and corporate power, just sort of dismantling everything that’s good about Canada, including walking out on Kyoto and this egregious assault on civil liberties, which, of course, is very far advanced in the United States. So he’s the kind of species that rises to political power and is utterly subservient to corporate interests at the expense of the citizenry. Yeah, he’s a pretty venal figure. GS: How critical is an Occupy-type intervention in Canada? CH: Well, Canada’s not as far gone, politically. For instance, there’s a way to work within the political system without having the Koch brothers and Goldman Sachs fund your campaign; you don’t have super PACs; you actually have more than two main parties. In fact, the Liberal Party was pushed to third by the NDP, so I’m a little reluctant to start telling Canadians what they should or shouldn’t do. I’m not that conversant in Canadian culture or Canadian political life, but I’m dead certain that you don’t want to funnel energy back into the political system of the United States, which is just theatre. It’s a vaudeville act, it’s completely rigged. Obama serves corporate interests as assiduously as George Bush did or Mitt Romney would. There is no way in the American political system to vote against the interests of Goldman Sachs; it’s impossible. That’s a line I stole from Chandler Davis. GS: Last year you were ambushed by the CBC. Were you aware of Kevin O’Leary’s reputation before you went on? CH: I never heard of the guy. And it was really depressing because it was the CBC, and if it was the CBC that it used to be—the CBC or the BBC—and they wanted me, I would go, because I thought they were a first-class news organizations. And the next thing you know, I’m on with an idiot who should be on Fox News. And I was furious because I was in the middle of a huge Occupy demonstration in Washington, and I walked to the CBC studios from it, and it was a waste of my time. And unfortunately I think it’s just emblematic of Harper’s assault against journalism that somebody like this would ever be on a current-affairs program. GS: We interviewed him here shortly after. He doesn’t think he did anything wrong. CH: Well, these guys are idiots. They’re really idiots, and because they can’t compete with you on ideas they descend to insults and character assassination, because that’s the only level of discourse they can engage in. That’s why I don’t go on Fox News. I don’t put myself in those positions, because it doesn’t contribute to public discourse in any way. GS: You became a fairly prominent voice during Occupy. In what other ways have you been smeared or undermined? CH: It’s been worse in the past. Because of my outspoken support of the Palestinians, I ran into the buzzsaw of the Israeli lobby in the United States. In fact, when I got up and denounced the plans to invade Iraq, it was far worse than anything I’ve ever done. I mean, all sorts of anonymous death threats, which was very ugly, bomb scares… So I’ve been through worse periods. Right after 9/11, I was pulled aside every time I flew by Homeland Security. When I came back from speaking in Italy, I was held at the Newark airport for an hour without any explanation until a supervisor came over and told the guy behind the computer, "He’s on a watch, tell him he can leave." In the immediate aftermath of 9/11 it was actually worse than it is now for me. You have to remember, War is Force That Gives Us Meaning sold 300,000 copies. So it’s been a decade of being sort of a gadfly. GS: You worked inside the mainstream media for a long time, and you know how it functions. And I’m interested to know, on the ground level, do the people who work at the New York Times understand or care about their role in enabling corporate capitalism, or is it more “turning a blind eye” as you say in the book? CH: It depends. You know, it’s a big organization. Some do. It’s filled with a lot of careerists who don’t really think about anything except advancing within the institution, and what they have to do in order to achieve another position in this climb to the top that most of them never make. Yeah, I mean, some of them do. I purposely chose to be in the developing world. I purposely chose to be in places like Gaza or El Salvador or Sarajevo, where there was tremendous amounts of repression, and I stood with those who were being repressed, in some danger, and reporting what they went through. I didn’t want to go to Washington, I didn’t follow politicians around, I didn’t want to cover the state department. I chose what I wanted to do within the establishment, and I felt that that gave my work a kind of integrity. What helped was the fact that most reporters didn’t want to do that kind of stuff. They didn’t want to go to Gaza. When I asked the executive editor of the New York Times, Joe Lelyveld, if I could go to Sarajevo, he said, "Well, I guess the line starts and ends with you." And living in Gaza in those days, before they put up the beach-front hotel, was difficult. I was living in an un–air conditioned penzione, so, you know, it wasn’t any kind of huge catharsis or change. I’m very proud of the work I did in El Salvador, and, boy, the Reagan administration tried to destroy me. The Clinton administration did a pretty effective job of destroying me in Bosnia because I wasn’t reporting what they wanted. I was always at odds, not only with administrations but with my own Washington bureau. I think there’s actually a kind of continuity to my work that, even though I did work for a paper like the New York Times, is readily apparent from the outside. GS: You visited four places for Days of Destruction, Days of Revolt, but how many other “sacrifice zones” are there in America? CH: Well, a lot. You know: the state of Ohio, the state of Michigan, the state of Mississippi… I mean, the fact is these were the first sacrifice zones, and the fact is these corporations are just harvesting what’s left. We went purposely to the worst, but you drive through all these states and it’s pretty depressing. I mean, Ohio is a wasteland. All these former manufacturing centres—there’s nothing left. And the signs of physical decay are everywhere. GS: The first time I really noticed anything like it was on a drive to Tacoma in 2000. What I saw just on the highway was outrageous enough. CH: It is, and it’s invisible because these corporations fill the airwaves with fantasy and celebrity gossip and tawdry crap and the Kardashians… That’s part of the power of having Sacco draw it out, as these people have literally been rendered invisible. GS: Is it uncomfortable or problematic to be identified with Occupy? CH: I always say I’m not a member of Occupy, which is a little disingenuous. But I was on the press so much because of Occupy, I didn’t want to be tagged as a spokesperson for Occupy. So I’d always say, "I’m not a member of Occupy," and at one point I actually went to the direct-action committee and said, you know, "Should I just stop doing media?" And they said no, because, unlike other well-known public figures, I mean, I spent hours and hours just listening, I did stuff internally, I spent a lot of time in Zuccotti Park just seated in the library, and I always did that on purpose, and I always spoke about they. I never spoke about we. GS: What I’m getting at is the way our cultural disposition trivializes or diminishes you through celebrity; it sort of adds a discrediting note, or divorces you and your message from real life. How do you tackle that problem? I mean, I assume you’d like to be more visible, but without the baggage it entails. CH: Not really. I’d like to be a lot less visible. I don’t like that stuff. I’m uncomfortable with it. And I’m really uncomfortable with being a celebrity, if anybody thinks I am. Because it’ll kill you, and the more you achieve celebrity status, the more you have to wall it off. Because the moment you begin to need or enjoy that kind of public adulation, that’s when it corrupts your intellectual work. And, you know, remember that I will take on very unpopular stands, like taking on the Black Bloc, which really angered a lot of people in the Occupy movement. I mean, I’ll say stuff that people who want to be beloved by the Occupy movement or any movement won’t say. I mean, I was walking around in 2008 slamming Obama and telling everybody that I was going to vote for Nader, and people were hissing and booing me in Berkeley. So I don’t really ever want to pander to the crowd. It’s why the Green Party asked me to run, and Rocky Anderson asked me to be his vice-presidential candidate. I won’t do that, because I never want to get up in front of an audience and want something from them. I always want to speak the truth and I have, many times in my career, gotten up and given talks where I know—and I’m not gonna pretend it’s pleasant—where I know that people are not going to like what I say. And I think celebrities—and I know a few—they won’t do that. They won’t say these unpleasant truths because they become—maybe addicted is too strong—but they need the adulation. Not only do I not need it, but I’m really uncomfortable when I get it. GS: Maybe that’s a way that the buzzsaw works these days. It takes prominent voices and makes them famous, and they become diminished. CH: Well, celebrity status, it doesn’t really matter if you’re radical or not, once you’re a celebrity and you desire to maintain celebrity status, you do deep damage to your intellectual honesty. Orwell is the model for that. You just have to continue to speak the truth. And, look, in my own career sometimes I’m up, sometimes I’m down. I mean, boy, I would walk into Occupy, and I wasn’t going to physically not appear, but after that Black Bloc [article], people were pretty angry. People came up to me, especially Black Bloc people, and they were angry. And many people in the Occupy movement felt that my attack on the Black Bloc was an attack on the Occupy movement. It wasn’t. But, you know, your friends tell you the truth. It’s my job to write, and in a way, I was kind of a lightning rod. But I think I won that battle. It triggered a whole discussion about violence and nonviolence and tactics, and I think it was salutary for the movement. But it certainly hurt my standing within the movement, without question. GS: In the book, Maria Gunnoe tells you that the department of environmental protection doesn’t work for the citizens, it works for the coal company. How systemic is that? CH: Completely. I mean, in southern West Virginia, politicians, the judiciary, big coal writes the school textbooks… It’s like a Communist state. Everyone is on-message, everyone works for the same company, and there is nothing within the traditional systems of power that is not beholden to big coal, including the senators in Washington. CH: Yeah. It’s so cynical. CH: It’s Orwellian, and cynical, and unbelievable, and it works. CH: I know, I know, and the irony is that it’s effective, because they’ve got the money to sort of shove it down everybody’s throats. GS: What’s the personal impact of staring into the abyss for as long as you have? CH: Well, I was a war correspondent for 20 years, and I’d had enough. And I came back and asked the New York Times if I could be a book reviewer. I really wanted a nice quiet life reviewing Russell Banks’s new novel, and I get sucked into all this… Well, this book was pretty awful, pretty painful; these stories just rip your heart. It was physically gruelling and emotionally gruelling, and I’m usually pretty quick to start another book. I haven’t done that. You can’t be around this kind of human misery as long as Joe and I were and not be deeply affected by it. You can follow Adrian Mack's contribution to the lobotomizing techno-nightmare known as Twitter at @AdrianMacked. People united will never be defeated! A visit to Google Maps seems to show the strip mining for bitumen north of Fort MacMurray dwarfs the strip mining for coal in southern West Virginia. As for politics in Canada, "totally rigged" is a fair assessment here too. I hope Bill Clinton wasn't too brutal with Chris ( in Bosnia ) when he reported on his war crimes. Unlike the other criminals ,Cheney and Bush, he is liked hear in Vancouver and the anti -war music fans will be cheering him on this September in Stanley Park when he blows his horn. I wrote an article on this site about Bill Clinton's alleged war crimes shortly before he visited the Surrey Regional Economic Summit last year to appear on the same stage as George W. Bush. A really great interview with a truly honest and courageous man, whom I really admire. 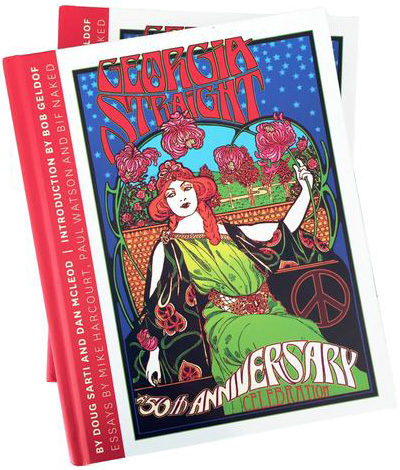 Thank you Georgia Straight. Thanks for the great Clinton article. Sarah McLachlan's "good friend" being a democrat is often over looked in these matters. Years ago Brian Adams took a anti-millitaritic stance by turning down a lucrative sound track deal for the movie Top Gun,this was of course during a republican administration. History shows, the democrats are actually even more war like. I would like Brian and Jann Arden, the Vancouver Mens Choir etc. to all read your article. They will all justify this stupidity by saying its for a good cause. The world is now owned by corporations. The wars are fought for lobbyists, oil companies, and the far right. Education and health are getting worse and the middle class is struggling. When a husband and wife have to work to pay the mortgage society is going in the wrong direction. Cheap labour in China and elsewhere and no more educated, skilled in Canada is a bad sign. Than trilliions are fought on wars to allegedly bring democracy to client states and friendly dictatorships. The lies, the corporate coverups from Wall Street to Madoff to intimidation of KiDDAA by KPMG in the Erwin Singh Braich blogs. The world and its corporate mentality are a scourge as corporations work in sociopath manner. No regard for humanity just profit. The ethical model is gone. In his book, Achieving Our Country, Richard Rorty describes how and why Leftist "movements" fail because they never become specific "camapigns" to affect real change. Hedges and the Occupy people need to transform their romantic preoccupation with the ills of society into the "People's Charter", a list of specific reforms which are "endlessly repeated and debated, equally familiar to professors and production workers, imprinted in the memory of professional people and of those who clean the professionals' toilets" in order to revitalize Leftist politics. (page 99) Although I don't agree with their goals, the Tea Party is a timely example of the effectiveness of "campaign" strategies. By refusing to rally the forces for change around a list of specific reforms and developing effective campaigns to achieve them, the "movement" people are actually facilitating a growing frustration and anger which becomes more and mroe likely to explode into the very violence they profess to deplore. It's time to wake up to reality and deal with it in the real world. I hope this interview makes the print edition. Yes, thanks for the great Clinton article and I hope you re-issue it in September when Clinton is here. Great Hedges interview too.